“I always knew I wanted to be a mother, but what I didn’t know was just how difficult of a journey it would be. Soon after my husband and I started trying for a family, I was diagnosed with infertility. Our first year of marriage was spent in doctors offices, planning our lives around fertility treatments. The rollercoaster of emotions that surround infertility can not even begin to be described in words. The hopeful highs and the crushing lows consume you. I looked for meaning behind the pain and I kept God’s promise close to my heart. I will forever remember the day I heard my son’s heartbeat for the first time. At that very moment my heart was forever changed. Motherhood is loving someone so much from the very first time you see their heartbeat. It is looking into their eyes for the first time and realizing they will forever be a part of who you are. It is the late nights, and early mornings. It is picking your four year old up in the middle of the night to rock him, because you know all too soon he will be too big to hold. It is hearing your daughter’s laugh and instantly being over come with joy. It is the constant struggle of wondering if you are doing it right. It’s the most difficult job that I will ever have the honor of being given. “Ashley has been a friend of mine since high school. It’s amazing to think of the girl I first met more than ten years ago and where her journey has taken her. Prior to this session, I hadn’t met Carson and Grace, but knowing Ashley’s sweet and easygoing disposition I imagined her kids to be the same. Within minutes, I knew we were doing something extra special. Ashley let her kids be themselves and we picked flowers together, looked for bunnies, ran around barefoot and just enjoyed each other’s company. They were so happy to give kisses and cuddles! It was such a joy to witness and photograph. Since having my son in 2016, I’ve developed a deep love for photographing mothers and new families. 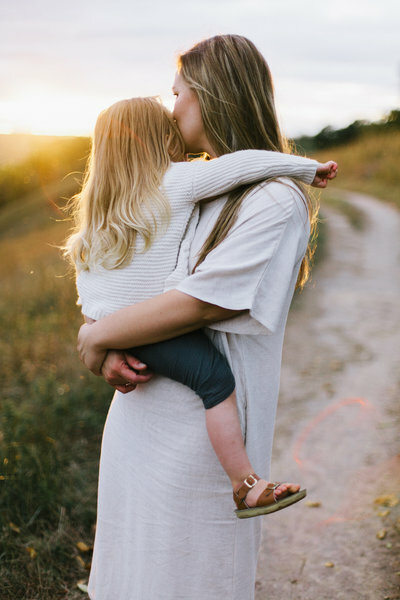 I know how it feels now to want to stop time right where it is – that feeling of being in the moment and knowing I’ll want to remember exactly what it was like, how small he felt in my arms when we brought him home or the silly ways I have learned to make him laugh as he grows.